I guess my problem is that I love thesis statement very much. I stuck at one paragraph and cannot move on to the other because I just find no concept to write. (Not that if I do write one finished post it will have a strong concept). A concept, defined in a thesis statement, helps to elaborate writing. It gives me focus on what I want to write. Now I sound like a teacher trying to shove in how to write an essay for my students. Pardon me. It is not that I don't have concept or focus that I want to write. Everyday ideas are all around, and sometimes those ideas knock on my head and I give them permission to enter. The problem is that I don't immediately write them down somewhere, and they're gone. Ideas are peculiar. If we don't hold on to them (as in write them down), they just decide to leave us. Weird, it's as if they're alive. 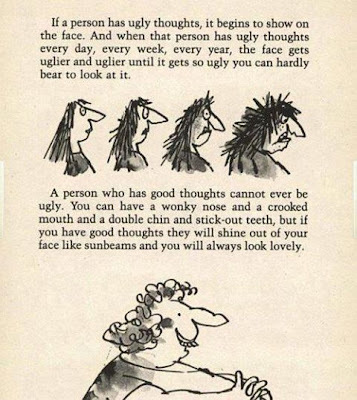 I have to learn from my ultimate favorite writer of all time, Roald Dahl, who wrote his ideas immediately when they come. One of most favorite pages from Roald Dahl and the brilliant illustrator, Quentin Blake. This is an excerpt from The Twits. A must read. Well, see you in the next thirty something days until the end of August.